Marah’s world revolves around trickery and deceit. She is destined to dance for money, for no man has ever successfully freed her from the traveling prison. Some have tried, and failed. No one wants to become part of the show. No one. 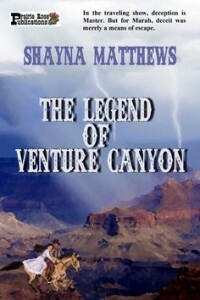 Venture is a man who abhors lies and deception, but sometimes curiosity can take hold of a man, in very forceful ways. They both make a startling discovery—some people don’t know how to die.